Further to our news item where we announced the publication of a glowing review by Hi-Fi Choice of the Evolution 50A integrated amplifier. We are now please to offer this review to you via a free download. Please click here… – Read more! Evolution 50A's first 5 Star Review! 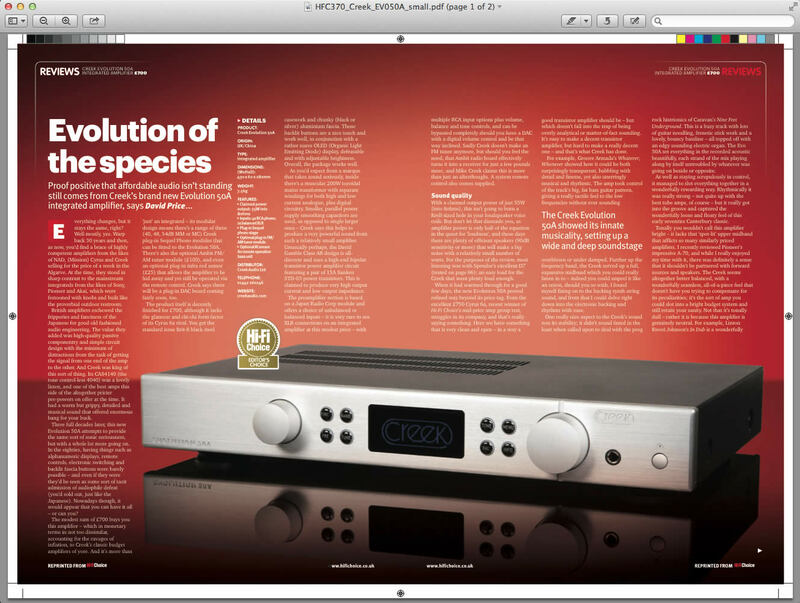 Creek Audio is incredibly pleased to announce the Evolution 50A integrated amplifier has not only been awarded an all 5 star review but has also been given the coveted “Hi-Fi Choice – Editor’s Choice” award. Reviewed by David Price in this month’s issue of Hi-Fi Choice,… – Read more! The Guys and Girls over at AnalogAholic have been kind enough to publish their review of the Wyndsor Phono Stage. To read the glowing review, please click here. I say this every year but I really don’t know where the time goes! It is that time of year when the biggest consumer electronics show opens in Las Vages. Make sure you come and see us, if not for the Music… – Read more! Whilst in Paris last month I was lucky enough to be able to visit two of our top dealers in France, 113 rue Cambronne and Renaissens. Their feedback on our new amplifier was excellent and we all spent some time listening… – Read more! I have just returned from Paris where I was not only taking in the wonderful sights the city has to offer but I was also on a mission. It gives me great pleasure to announce that new Evolution 50A has won a Diapason d’or award for… – Read more! In the autumn of 1981, in Ashurst Road, Friern Barnet, north London, sat a worried man. It was six years since he had started his own design company (M.R. Creek ltd) but, sitting at home behind his old drawing board in… – Read more! Today marks a very special day for Creek Audio, it’s our 30th Birthday! 30 years ago today from the spare bedroom of the family home, Mike Creek sold the first ever Creek amplifier to Audio Projects of Leeds. Mike has written… – Read more! Over the past few months Creek Audio has been enjoying a high level of success by winning multiple awards and recommendations. Below is a list of these wonderful achievements and some comments from the reviewers. Evolution 2 CD Player HiFi… – Read more!